And, I'll also celebrate this first anniversary of my blog by posting this blog post, and telling you about how it came to be, and some experiences I had! So, let me tell you the history of my blog! Here it goes! Yeah, I made this blog on June 11, 2009. Whew! I wrote three (3) blog posts on that date! A welcome post, almost class opening, and summer '09 almost ending! See? I was just as excited that time for school! I think only really, really small things had changed on me. Hmm..I kept on visiting Ate Pearl's blog, so that I could observe more on how to use a blog. Two days after that, I designed my first layout. Here's the post telling about it: http://vannice95.blogspot.com/2009/06/new-layout.html ! Too bad I didn't have the screenshot for the layout! So you see, my first blog title for this blog was "Story of My Life". Very simple isn't it? Next comes "It's my Life, It's now or never", then I think "Take a Deep Breath" was the next and it was the last blog title I could think of for this blog. Yeah, it was the layout before this, just that the difference is the header, and the navigations! I still made some minor adjustments on this layout after that. Another thing, or problem I encountered while making my layouts was how to make my navigations. Since Ate Pearl was the only one I knew who has this amazing feature on her blog, I asked her how to do her navigations! She gave me a link which I referred and followed how to do it, but still the result I wanted to show still didn't come up. I asked for more help from Ate Pearl, then she answered about reverting my XML template to the classic HTML template. I did not understand at first what direction could this tutorial bring me, but now I finally do..haha.. :D Since navigations like hers and mine are usually made in HTML templates, she advised me to revert to that. But because I found that it was harder to deal with it because I was new and worried about what could happen to my blog layout, I decided not to revert it. Hmm..looks like I kind'a regretted that decision, and at some times I don't! I regretted it because my "BLOG" navigation is the only one different from the other navigations because I could not find a way to link it like other navs. But now I don't regret having this XML layout anymore because I thought it was easier to deal with! Well, enough for the layout! Let me tell you my experiences as a blogger! There, I installed the Shoutmix box for the first time. People from all over the world came by and tagged on my shoutbox. One blogger dropped by and said, "link-ex?". I'm not really sure what to reply to her, so, err, I kind'a replied something about "link example"! LOL! :D I was really this new to this blogging thing. I'm not exactly sure how I knew what "link-ex?" meant, but I finally knew about it during the month of August, August 30, 2009 to be exact. After that, this started some daily traffic on my blog! I dropped by a lot of blogs and said, "link-ex?" or "care to link-ex? ", and in return, some also dropped by my blog and invited me for link exchange. It was really fun! That's the time I met new friends! Some friends I recalled are Ate Rich, Ate Rose, Kuya Arvin, Kuya Jose, Kuya Julius, another Ate Rose, Ate Dyane, Ate Jhen, Deniece, Toni, Pat, Kuya Sendo, Ate Grace, and many others! Yeah, I really did meet a lot of friends! I thank you all for being such good friends to me! By being so understanding and all! You all have been there for me! Thank you very, very much! I hope we could be friends for a long time! I also learned a whole lot from other's lives! I began to become interested on other's lives. Being here in the blog-o-sphere, I also received some awards and tags! The first tag I received was from Ella! I was so happy that I got tagged for the first time! :D And, the first award I received was from Kuya Jose! Again, I was very happy. I was happy with these because I already had complete experience in the blogging world! It's good that these all happened before my blog turned one year! At least my time here is becoming a bit worth it! :) Thank you so much! :D Later after those, more tags and awards came! That made me even more happier! We continued to find ways of earning money online. I tried Geostring, MyLot, Cashcrate, Triond, and many other sites. I did earn some money, but they're just too little to cash out, so, so far, I hadn't gotten my earned money yet. I came across this Blogger friend, Dennis. He suggested me to get my own domain so that I could earn a lot of money like him. But I was so hesitant because I had observed other domains that they became expired and not working anymore, and some said that it was a hassle to renew it and pay for it and all. But as what this blogger friend had told me, some pros that we could get from domains are that some advertisers choose paid domains for advertising other than non-paid domains. This kind'a make sense, but what I worry about is that my blog could be in-danger, and would be gone, and that's the last thing I'd want to happen to my blog! I thank my parents so much because they had been an avid fan of my blog, especially my mother who kept on reading every latest post I had and telling every single detail of it to my father! Thank you Mama and Papa! I also thank them for this Internet connection and laptop, support, and for making my life the way I wanted it to be! :D Without them, I could never exist! Thank you so much to all of you, especially God, family, and to my blogger friends! Wow happy birthday to your blog! I still love the blog owner than the blog itself! LOL! hahaha...I am happy I know you here! Anyways, God Bless You always Nice and study hard! @Jhiegzh: thaank yoOuu!! haha.. :D thanks so much kuya jhiegzh! :) God bless you too! Girl, birthday ng blog mo di ba, nasaan ang REGALO ko? HAHAHA! Joking! 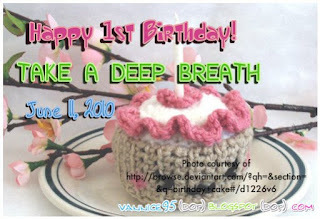 HAPPY 1st Birthday ng blog mo, actually, ndi naman pwedeng anniversary, ndi naman kinasal ang blog mo sa ibang blog di ba. hahahah! Yipeee..happy birthday sa blog mo. Malapit na din sakin sa July 4 :] share lang. 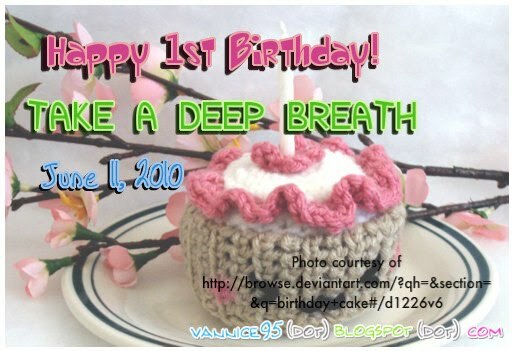 happy first anniversary sa blog mong ito..
wow. HAPPY BIRTHDAY to this blog! i really like this new layout. it so retro school girl. I love your new blog layout! Super gorgeous!